I was so excited to head over to the Nordstrom’s Anniversary Sale that started last weekend. It’s a little like Christmas for me. I made my way around all the lovelies to see what was catching my eye. I saw these pretty Calvin Kleins in the mailer and thought they were pretty but I was even more taken by them in person. I had reservations about Calvin Klein shoes because I bought some a few years back when they started making shoes. The pair was this beautiful peep-toe wedge of sherbet stripes that got lots of compliments. Sadly, when I wore them to work, I left a trail of blood around the office from the insane blisters they gave me. So this time, I was going to make sure to take my time trying them on to avoid a repeat. 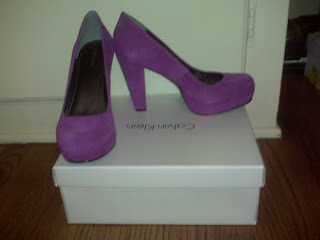 As I slipped on the ‘Scarlet’ Platform Pump, I fell in love with them. They were so well padded that it was clear Calvin did his homework and made some improvements to his shoe designs. The sole has a textured brushed effect that keeps the sole from sliding on carpet. The heel is about 3 ¾” with a ¾” platform. I walked around the shoe department in them as I looked at more shoes to get a good feel for their wearability. They were keepers! I wore them to work yesterday and didn’t have single moment of discomfort. All throughout my day, I would catch glimpses of the pretty berry fuchsia and it made me so happy. One note, because they are suede, I did treat them with scotch guard spray before I wore them. It’s good to spray them before each wear to maintain the suede looking its best. The spray takes usually about 30 minutes to dry so I usually spray them before I do my hair and makeup to give them time to dry. You should also brush them with a nailbrush from time to time to avoid having the suede looking matted down. Normally, these are $109.95 but during the great Nordstrom’s sale, they’re only $72.90. Color me happy! I can't tell you how much I appreciate this!! I love that it comes in another color as well...I think I might have to go out and purchase a pair!! what do you mean you "brushed them with a nailbrush" I just bought these shoes and want to keep them in good shape.